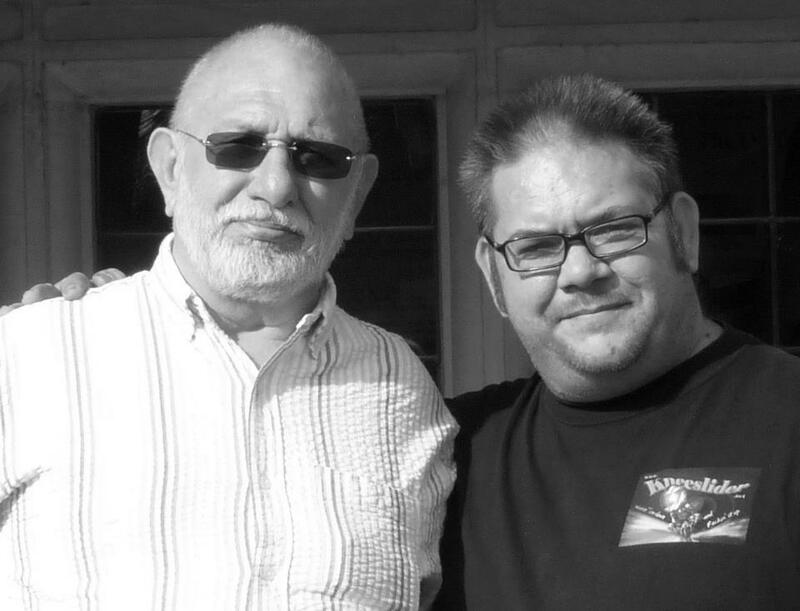 We are saddened but pleased to publish herewith, details of Dave Hines internment service as received from Son : LEE 'BEANZ' HINES. Tributes have been flooding in for this talented and poular grappler from such great names as : TONY BANGER WALSH, NEIL GB SANDS, MICKEY SULLIVAN, KLONDYKE KATE, JOHNNY WILSON, KARL HEINZ, JOHNNY KINCAID, TONY SCARLO, MICK MCMANUS, JON KOWALSKI, BOBBY ENGLAND,plus many more. Before the days of pumping iron and steroids; over the top extravert showmanship and the modern styles made popular by our friends in the States, there was good old fashioned British wrestling. Flying around the ring at every opportunity and diving off of the top rope was a rarity and a treat, but most enjoyed the Brits style of close contact holds and throws which brought an element of reality to entertainment. The dress code has somewhat evolved too. Long gone are the basic boots and leotard, and a more circus like attire has been adopted. We can blame the British television bigwigs for the change and decline in British wrestling. For years it was most popular on World Of Sport, presented by Ken Walton, and there was uproar from thousands of fans when the show was finally cancelled in the 80's. From then on, American wrestling became more and more popular and our own guys not having the same amount of funding or television coverage, caused the newer generations of fanbase to cross the Atlantic. As an 80's child myself, and the son of a wrestler, I witnessed the transition first hand. Ask any 10-30 year old to name a wrestler and they will probably say the likes of Hulk Hogan; Brett "Hitman" Hart; The Undertaker; Britsh Bulldog and Randy Savage. Ask someone who is aged between 30-50 and they will reminice watching Giant Haystacks; Big Daddy; Kendo Nagasaki; Dave "Fit" Finlay; Mel Sanders and Stevie Gray to name only a few. If you were to ask the same generation who Dave Hines was, chances are they couldn't tell you, but ask any British wrestler from the same era and they will not only tell you that they know the "Rat Catcher" from Portsmouth, they will go into great detail of bouts when they have worked with him, and would describe him as one of the most versatile, funny and pioneering wrestlers on the circuit. Years of accompanying him to shows as a child, and attending annual reunions since his retirement confirms that he is famous and well respected within the British wrestling fraternity. Every show I attended, I was allowed to sit in the dressing rooms where he was always greeted with a "Hello Dave". This is mirrored by the "old timers" at the annual reunion and I enjoy listening to the tales of my dad from "the good 'ole days". I was the envy of my friends, and whilst by choice he was not a "good guy" or TV star, he was my hero. 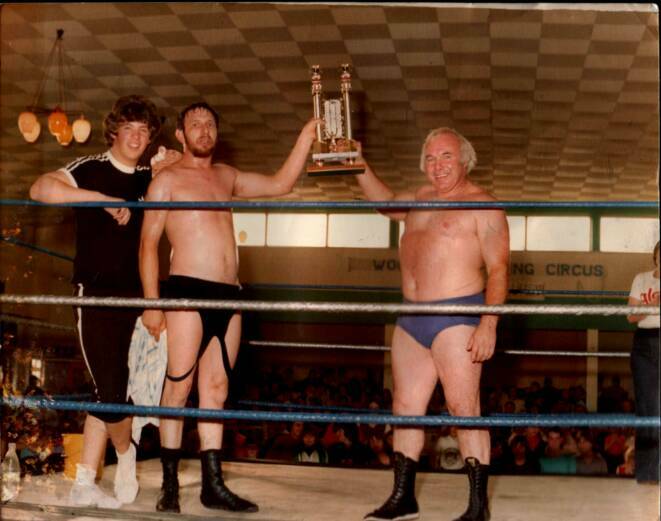 Born in Portsmouth, 20th June 1947, Dave Hines first became interested in wrestling at the age of 19. Turning up at the Grove Club, local to his home in Paulsgrove he observed another infamous wrestler and trainer, the late Butch "Crusher" Mason (my uncle) who informed him that at 5ft 11in, and weighing just 10 stone, he "would never make a wrestler all the time he had a hole in his arse!" A derogatory remark he would regret, and spent the rest of his 40 year career praising Dave as the best light to middleweight villain you could ever wish to wrestle. 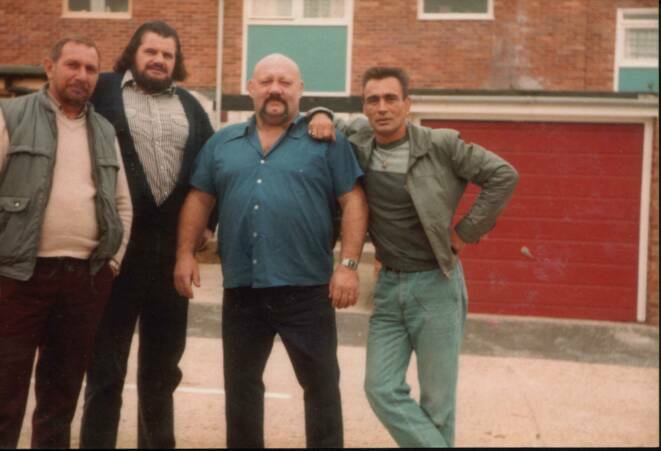 Dave, with his challenged physique compared to most, perservered and trained hard at Bruno Elrington's gym in Greatham Street Portsmouth, rubbing shoulders with already established stars such as Bruno himself; Bronco Roger Wells; John Kowalski; 'Tarzan' Johnny Wilson and brother Peter; Mickey Sullivan; Lee Nolan and Tarantula (aka) Alan 'Spider' Turner. Under the training of 'Crusher' Mason, Dave's interest wasn't just a hobby, it became a way of life with every day of the week pre-booked with either training or shows. Other venues used for training were the Reginald Road School and the Brook Club. 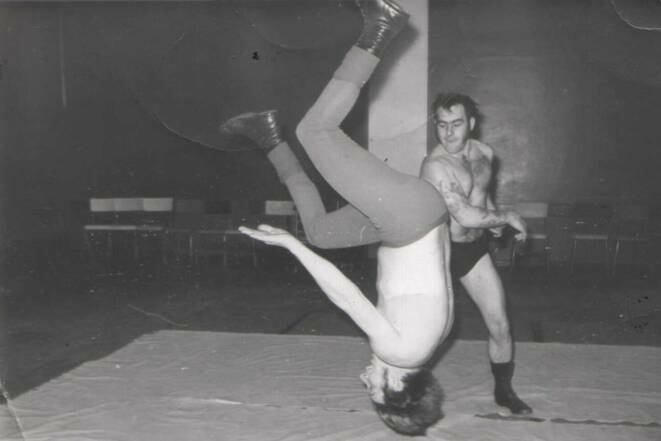 Dave made his wrestling debut in 1968, performing his first professional bout against Lee Nolan (aka Johnny Sparks) at The Leigh Park Community Centre in Havant. From then on, with the foundations of a good wrestler instilled, Dave soon developed his own superfly; agile and versatile style of wrestling which was well respected throughout the circuit, and easily adapted to suit most bouts and opponents that he encountered. Perfecting his three favourite moves; The good old British Forearm Smash, The Short Arm Scissors and being one of the very few wrestlers that could actually Drop Kick and land on his feet, his wrestling was regularly complimented by peers. With a career spanning over 30 years, Dave Hines wrestled for big Promoters such as Brian Dixon; Dale Martin; Ken Joyce; Bronco Wellsd Orig Williams, and was billed with, and against, established wrestling stars like Mick McManus; Jackie Pallo; Pat Roach and Steve Logan. Pretty much, most of the stars from the era had either rubbed shoulders with him, or seen him work and complimented his style of wrestling. Dave was sacked from Dale Martin promotions following a bout with Mickey Sullivan in Hastings where he verbally wrestled with heckling punters. Audience put downs were frowned upon and not practised during the era, but would shape the future for villainous wrestlers' in years to come. Harmless insults; put downs and banter are now widely exercised throughout worldwide wrestling, and play a big part in a wrestlers persona. Dave's infamous audience put downs were "You'd make a good advert for tinned milk - Cow & Gate! "; "They shoot horses when they get to your age!" and "Next time you try to commit suicide, stick the gas oven in your mouth!" to name just a few. Following the immense reactions that such behaviour sparked, and realizing that at times, a villains "heat" was as good if not better than the "blue-eye's", Dave preferred to be a villain but was versatile enough to adapt to any given circumstances and was never typecast. He never took himself seriously and could always laugh at himself. As with any organisation with healthy competition, rivalry politics played a big part, and for this reason, Dave declined offers of being a TV star and remained a 'freelancer' - working for anyone that paid him! As well as touring the country, Dave worked the wrestling/boxing booths for MA McCowan and also spent weeks away from home performing on the holiday camp circuit for Jimmy Hagen. He was nominated team captain on numerous occasions, and driving miles at a time, enduring sometimes four or five gruelling shows per day, life on the road as a professional wrestler was no walk in the park and only made easier by dressing room tales, jokes and antics. After four years on the road, the opportunity arose for Dave to represent the UK in the world championships held in Zimbabwe, along side his mentor 'Crusher' Mason; Mickey Sullivan and Tarantula. It was after the return of this trip, that Dave Hines turned semi-professional and obtained a regular job with Portsmouth City Council's Pest Control Department, enabling him to be at home more to support his wife (Crusher's sister and my mum) and two kids. Although now working for his hometown council, Havant, pest control is still the line of work he undertakes today and one wrestler in particular, Steve Logan - The Iron Man from Brixham, was always fascinated by Dave's tales of rat catching. Wrestling remained poignant in Dave's life however with nearly every weekend taking bookings from various Promoters such as Jimmy Hagen; Scott Conway and John Freemantle, where he was billed as the 'Rat Catcher'. It was at this stage of his career that I was at the age of inquisition, and permitted to attend the shows with him. Whilst being extremely interested in wrestling at the time, and practicing many holds and throws in our living room, my dad was adamant that he didn't want me to follow in his footsteps and to make something of my life. After attending the annual reunions with him, and seeing first hand, the toll time has taken on some of the extraordinary impressive athletes hobbling around, I thank him for it and respect the reasons behind his decisions. The wrestling world is in mourning yet again at the loss of W.O.S. star : DAVE HINES, who has succumbed to cancer after a long and heroic fight to stave off the scourge that seems to claim most wrestlers. Dave's Son : LEE 'BEANZ' HINES has thankfully kept us informed of his beloved Fathers condition which deteriorated rapidly quite recently. During his long and most successful career , this enigmatic and popular grappler worked with many of the boys and tributes have been flooding in on the Reunion Facebook page from former colleagues such as BOBBY ENGLAND, STEVE BARKER, MICKEY SULLIVAN and many more.Following retirement from the ring, he turned his skills to training young wrestlers and was responsible for MARK SLOANE 's debut into the Business. We shall publish funeral details when available. Meanwhile, our sincerest condolences are offered to Lee and his Family.